Custom handmade by order boys Taz baseball shirt and denim/jean short set. Top was made using red mesh both for the shirt and the lining. Baseball Taz white w/blue stripes fabric is used on the sleeves, pocket and the facing of the shirt. On the back of the shirt is the phrase "Born 2 Play", using the denim fabric. The prhase is customizable, so you can use your own phrase if wanted. The shorts w/elastic waist, were made using blue denim/jean fabric. Shorts have to large side pockets; one pocket has an applique of Taz getting ready to catch the ball and yelling "Throw It!" the second pocket has Taz diving to catch the ball and yelling "I Got It!" There's about six (6) different action poses, so the pockets may not have the same appliques as pictured, but will still be as unique. The smaller side pockets have a baseball, glove and bat embroidering on one side and two baseballs embroidering on the other side. The pockets and the shorts are trimmed w/the baseball fabric. This set is made by order so please be sure of size!!! Custom handmade by order boys hoodie shirt and short set. 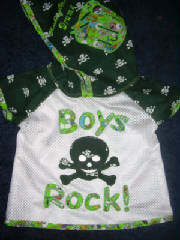 The hooded shirt was made using white mesh fabric and dark green w/white skull crossbones fabric. This set has lots and lots of details. 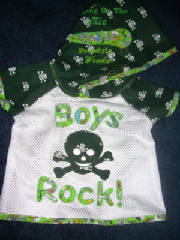 On the front of thes shirt is a skull crossbones applique using the dark green fabric, and the word "Boys Rock! ", using green fabric w/skeletons playing music. The sleeves and hood of the shirt also has the dark green fabric. On one side of the hood is a drum applique w/the phrase rock on the drums embroidered. On the other side of the hood is a microphone applique w/the phrases "Jay rapping on the mic" and "freestyle wrecking"
You're welcome to use your own phrases instead of mine. A microphone applique is on the back of the shirt. The shorts w/elastic waist, were made using white denim/jean fabric. There are four (4) pockets on back of shorts. 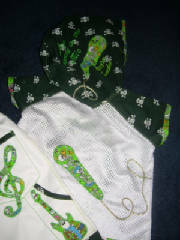 Two upper pockets have music notes appliques and the lower pockets have guitar appliques, all using the green music theme fabric. 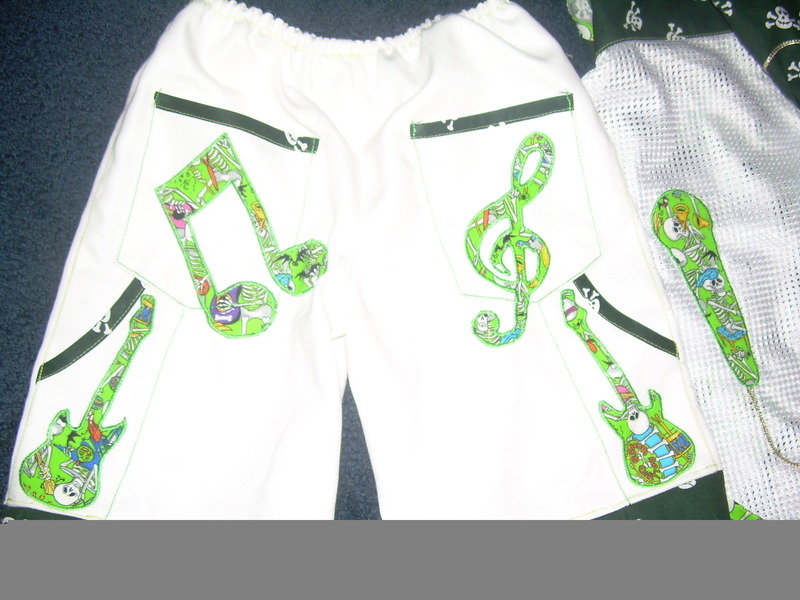 The front of shorts have a music note on one side w/the phrase "I Believe I Can" and "Play the music" and a trumphet applique w/the phrase born 2 play music. The pockets and bottom of shorts are trimmed w/the dark green skull fabric.